Anyone who has followed my articles to this point knows I play a moderate amount of League of Legends, and I am here again to cover the next big change: Season 5! The big buzzword this time is “Strategic Diversity” and unlike most seasons past, I actually believe in it. I have been faithfully following the upcoming changes to champions (A “One-Day” Taric Visual/Rework Update), improvements to make Baron and Dragon relevant, new buffs, items coming and going (R.I.P. Feral Flare: Season 4-Season 4), and much more. I’m going to outline some of the more important changes and what they could potentially mean to you in the upcoming season. Just covering all of the changes in a list would be insulting; anyone can go and read the patch notes (even though I think not enough players do so.) Instead I am going to be pointing out the most important things to be on the lookout for. This is by no means complete. There is still much inhouse/player testing coming up and things could change at any moment. I’m incredibly excited though! While not always a fan of change, I think these changes could shake up the League community in a positive direction. With more choices than ever before, I would expect a lot of normally unplayed champions to resurface as the wildcards of the community experiment! 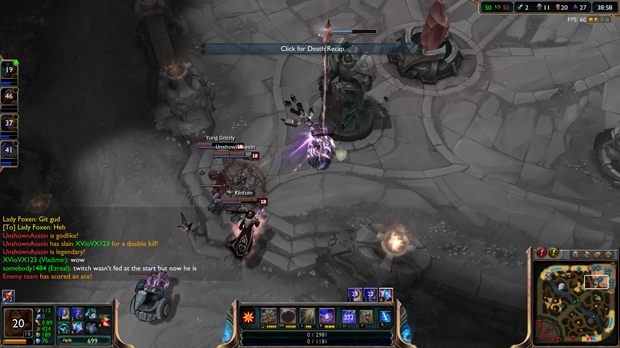 One of the most infuriating things is to watch one champion single handedly backdoor. Your team is helpless as Master Yi, Tryndamere, Hecarim, Shaco, or some other champ decides they want to come back and just push other lanes solo, with so much speed and damage that nothing can deter them. 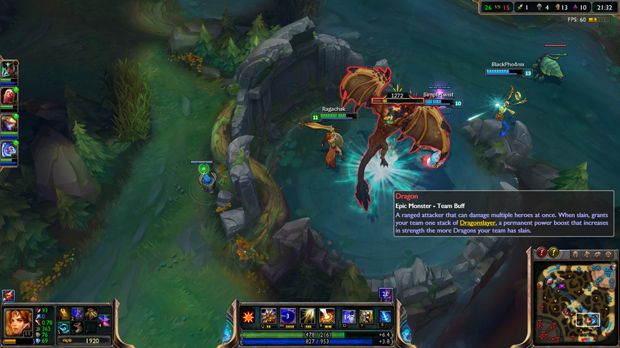 This is something that Riot has evaluated, and finally has a solution for. Stats on Towers have changed a bit, but that isn’t the important bit. Inner Turrets now have a regeneration field given to nearby champions to help prevent them being pushed down without a fight. Inhibitor Turrets are even more dangerous; instead of little shots, they fire a deadly laser beam that slows, deals terrific damage, AND reduces the targets damage output! Still think that tower dive is worth it? The idea is not to ruin any chance of backdooring, but rather to make it more balanced. If one player can singlehandedly change the entire game, there is likely something wrong. Now they can adjust/scale the towers, instead of simply nerfing a champion into the earth (as has happened on many occasions in the past). Speaking of the lane, assist gold is changing, and now early game kills give full gold instead of the lessened amount that we saw in Season 4. 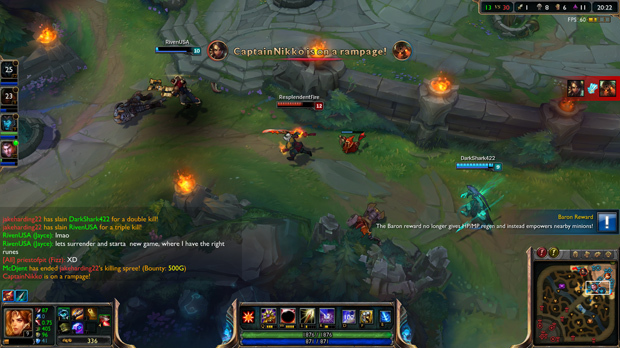 Starting at 50% of the kill and going up to 75% as the game progresses, this is another way to hand supports gold. That’s fantastic with the new item choices; ultimately this will hopefully shake up what the supports are building, and not just one or two sets of items. Gone are the days of Baron being an afterthought, the days of champions soloing/duoing Baron without a great deal of power and skill. Dragon moreso, perhaps, with the permanent buff he offers. Dragon was once a gold farm, creating a very easy gap between teams. Now, with each Dragon kill your team gains a permanent buff that grows with each successful Dragon kill your team gets. The buff ranges from a bit of damage block, all the way to tripling all other bonuses, as well as giving your attacks True Damage over time. The final buff (five kills) is not permanent, lasting only 180 seconds. I do not forsee it being a factor in many games. As teams will clamor and fight desperately to attain the buffs, more strategy and ward coverage will be required. Teams that let the adversary simply take Dragon without a fight will regret the choice. Baron gives two very new and different buffs in this season. Gone is the enhanced regen/cdr that we normally see. The Enhanced Recall I think is a little ridiculous, but it does allow for swift regrouping as well as quick pushing from lane to lane to stop minions from getting ahead of your turrets. The real winner here are the Empowered Minions. 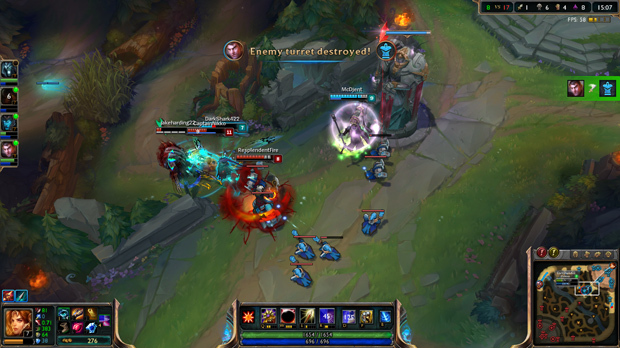 When your minions are near someone with the Baron Buff, the minions grow more powerful. Better Caster Minions, Tankier Melee’ Minions, and Rangier Cannon Minions. Combine this with Banner of Command for hilarious results! The idea here is to create a siege breaker. 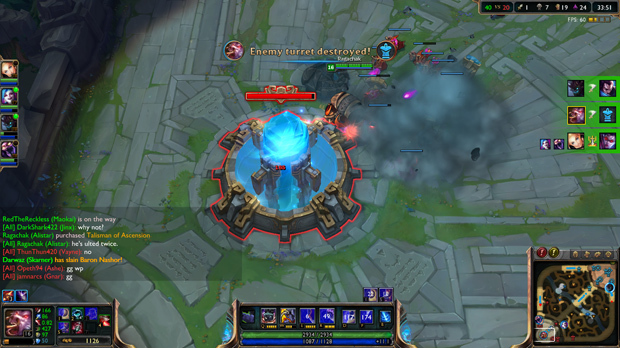 If the enemy just can’t be beaten through, grab Baron and overwhelm their defense! Expect Baron to be stronger to defeat, balancing the higher reward with more risk than ever before. And not a drop to drink. Many items are leaving us, some that have been around for ages (such as Atma’s Impaler) and are likely never to be seen again. Some items were simply a failure or not what was intended, such as the Feral Flare, which lasted a whopping one season. The old jungler items are gone as well. This is probably the biggest change to the itemization; new items that build out of the Hunter’s Machete influence how your “Smite” spell works, which will probably passively force junglers who refuse to use Smite (Looking at you Maokai, Shaco) into using it, if for no other reason than the faster jungle clear. There are four new items that adjust your Smite, ranging from AOE damage to the ability to damage other players. This is brand new never touched utility to help change up how junglers’ see their summon skill. I feel that there will be fewer “must-buy” items, and more situational items. There are other items that are also making a grand arrival, such as Righteous Glory. A new tanky support item, it offers HP/Mana, but more importantly, gives movement speed to nearby allies who are moving towards enemies/turrets! Combine that with its activated ability which culminates in a shockwave-style slow. This is an item I feel will be a complete game-changer. Another item I foresee making a comeback due to changes is Ohmwrecker. I desperately wanted this item to be used, and its ability to shut off turrets could make diving worth it. Alas, last season, it saw virtually no play at all. But it had a retool, and it certainly is for the best. Elixirs! These are gone. Replacing them are pricier/better consumable potions, only one of which can be active at a time. 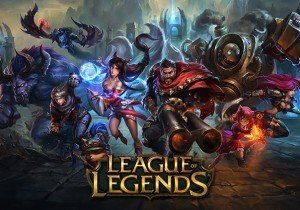 Instead of generic damage buff potions, we have the Elixir of Iron, which increases size of champion/tankiness as well as Path of Iron buff (players who follow the path gain movement speed), or the Elixir of Wrath, which gives damage, a “Bloodlust” buff, and damage to champions gives back percentage of hp. 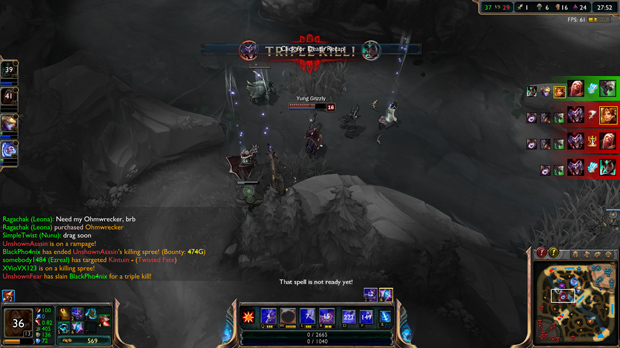 Kills/assists also increase its duration by 30 seconds, so assassins will be taking this with frequency. There are a lot of changes, that’s what! Tons of new items; the jungle has changed, with large mobs in the jungle each offering a buff with Smite kills; the scuttling “Rift Crab” that is a neutral river mob, giving vision to people who kill it. The big word this season so far is “Strategy.” There are far too many changes to go over all of them right here. 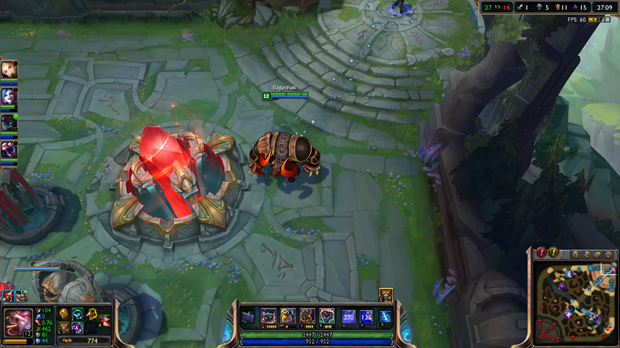 Summoners should take the time to learn what changes are coming and play to experience them first-hand. Playstyles may be disrupted or changed with all of the nerfs, buffs, and item changes. I genuinely feel that there is something for everyone in this season, which adds some radical new updates to how the game is played. Now if only they could do something about the servers, that’d be perhaps the next new project. There are of course detractors that miss their precious Feral Flare, but when junglers are simply farming jungle and never coming out, are they still junglers? Or is it just another lane to worry about? These changes are being rolled out into all facets of the game, so ideally, people will play more normals/team builder before jumping into the ranked preseason. Also: To those curious, ranked matches in the preseason DO matter. If someone tells you otherwise and plays poorly on purpose, they are wrong. It will affect your MMR. I wish everyone luck and new, exciting experiences in Season 5!